One of the best things about vehicles is that you can do anything with them. 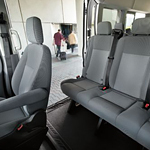 When it comes to vehicles like the 2019 Ford Transit, you have a lot of options of what you can do with the experience of this vehicle. You can bring about any environment for you and your passengers with this passenger wagon. One of the features that make the vehicle easy to manage when it comes to making adjustments is the set of conversion van options that are available. For instance, you get features such as the captain's chair seats for the passengers. Another feature for the conversion fan options is the power third row sofa bed. This is for passengers who might be a little tired and need to rest comfortably while they are on the road. You can also include a flat screen TV for entertainment while you are on the road.